Happy Birthday to my son. He turned 19 today! Char-Grill on Hillsborough Street in Raleigh, NC is hopping on Sunday after church. You should see it late on Friday or Saturday night. Our Char-Grill orders are up. The boys really pig out when we make it to Raleigh and get the world's best restaurant burgers. Now, that's a super burger. Sadly, it is upside down. Hungry guys do not spend much time primping food for photos. But, you get the idea. Birthday Lunch at Char-Grill for my Son Who Turned 19 Today! My boys grew up on home cooking and lots of beef on the grill. The first to leave the nest is at UNC where it appears that he is starving. No offense to the cafeteria or to the eateries on Franklin Street, but those bagels and wraps and preppie burgers just aren't doing the kid proud. Today is my son's birthday, and his favorite place to eat (besides home) is Char-Grill in Raleigh. Yes. I know that UNC and N.C. State are rivals. I'm a State grad (turned down UNC - thank you very much), but the kid had his heart set on UNC. So, that's where he's at. He's enjoying it other than the food. We drove over to Chapel Hill and got the birthday kid and headed on down I40 to Raleigh and to Char-Grill. My son first got turned on to Char-Grill when he was visiting colleges. 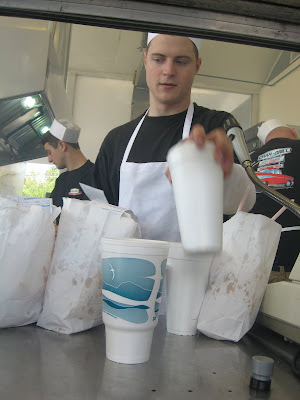 I took him up to see N.C. State and had to pick up some burgers at Char-Grill. When I was a student at State, that was the thing to do on weekend nights. Students closed the bars down and then hit Char-Grill for burgers and fries. This was back when the drinking age was 18 and when people did not shoot each other. He wasn't so keen on all those bricks at State, but he sure did like the Char-Grill burger. He was only sorry he didn't order two after we got back to the motel room and opened up our Char-Grill bags. The original (and my favorite) Char-Grill is in downtown Raleigh. It takes only a few minutes to drive from N.C. State, unless you get lost. With all those one way streets, getting lost is a definite possibility. Back when I was in college, I was often the designated Char-Grill burger girl, but I insisted on having a co-pilot to make sure I did not end up in Virginia or Canada. Char-Grill does not look like the kind of place where you're going to get the best burgers ever. It's a little dive. You can see in the picture. It is not fancy. There are two picnic tables to the left side, but most people either tailgate in the parking lot (so to speak) or grab and go. Inside dining - forget it. There's no room back there where they are pumping out the flame broiled burgers. When you get to Char-Grill, you get an order form and check off what you want and what you want on what you want. If two people want the same burger but different toppings, then you need separate order forms (though can pay all the orders together at the end). Some toppings are not listed - namely mustard. Just write that in. I also write in chili, because I love that on my Char-Grill burger. You stick the ticket or tickets in the hole and wait to hear your name called. The burgers are 1/2 pound like in the third photo above or 1/4 pound which is on an oblong bun. Then there are the smaller burgers which are easier to eat while driving, but you probably want at least two of those - or more. The combos come with fries. They are the bigger and fatter French fries - more like Wendy's. They keep the grease fresh, so those are general fries but always spot on. While you're waiting on your food, you can watch the grill guys firing up the burgers. Yes. You can see the flames. All the more reason for them not to have tables inside. It's fast and furious behind the glass. Those burger guys earn whatever they make. 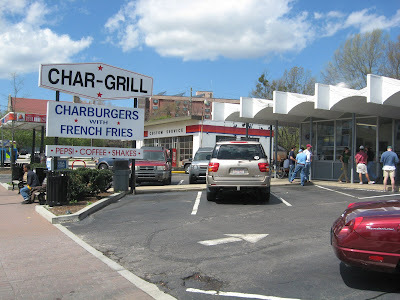 Char-Grill got so popular that they have other locations in Raleigh. Some of them are easier to get to than the old downtown burger joint, but they just don't have quite the spirit of the original Char-Grill. Not to worry. The food is fabulous no matter which Char-Grill you visit. Going to Char-Grill is always a blast from the past for me, and I'm glad my son loves Char-Grill as much as I did at his age. 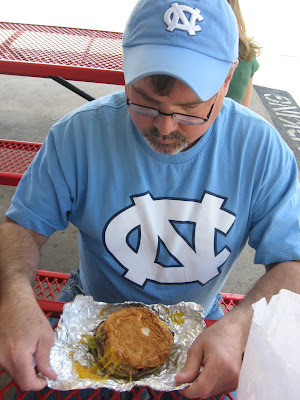 There are plenty of places to eat in Chapel Hill, but it's a treat for us to take him over to Raleigh for a real burger. My hand patted grilled burgers top them, but I can't think of any other restaurant that makes better burgers than Char-Grill. If you are ever in Raleigh, look up Char-Grill. You won't be sorry. They cook their burgers over real fire, and you can stand there and see them making your meal. Your mouth will be watering. UNC also made it to the Final Four today (3-29-09), so we cut out before the game, so the kid could enjoy some time with his frat friends. We stopped by Trader Joe's on the way out of town. I love to get seasonings for my barbecue dishes at Trader Joe's One of my favorites would be the lemon pepper in the grinder. It's very inexpensive, but the flavor really pops when the lemon and pepper are fresh ground. I also have to get the Lacy Cookies at Trader Joe's, because they are the max and not good for me but are a very nice treat.